This form is used with a customer who wants you to make changes other than what you originally recommended. Protect yourself by having your customer sign off that they are taking responsibility for the new direction. This Project Consulting Override is included in editable Word format that can be customized in Word or by using the included Wizard software. General Description of Project Deliverables. Company Name arrives at its consulting solutions using the best available science, Company Name experience and marketing practices. Before continuing any additional work for the benefit of the Customer, Customer acknowledges that it has received the following consulting and recommendations concerning the development of the project from Company Name and has requested that Company Name implement a solution other than what was recommended by Company Name. Further, Company Name understands that any estimates provided to them prior to the date on this agreement may require revisions and/or adjustments to the pricing based on the different solutions chosen by Company Name. Please initial the following sections, which detail the project's deliverables contracted between Company Name and Company Name, and sign the Acceptance of Agreement at the bottom of this document. I certify that I have read and understand the above Project Consulting Override from Company Name, and that all questions or concerns that I may have regarding the above have been adequately answered by Company Name to Company Name's satisfaction. I further certify and release Company Name from any damages, whether direct or indirect, as well as any obligation or duty to correct problems arising out of or contributed to by Company Name's decision to implement a solution or strategy other than that which was suggested by Company Name while acting as a consultant to Company Name, unless otherwise agreed upon in writing. I understand that, by signing this agreement, I release Company Name from any and all liability, tort, or claim concerning this change to the project. 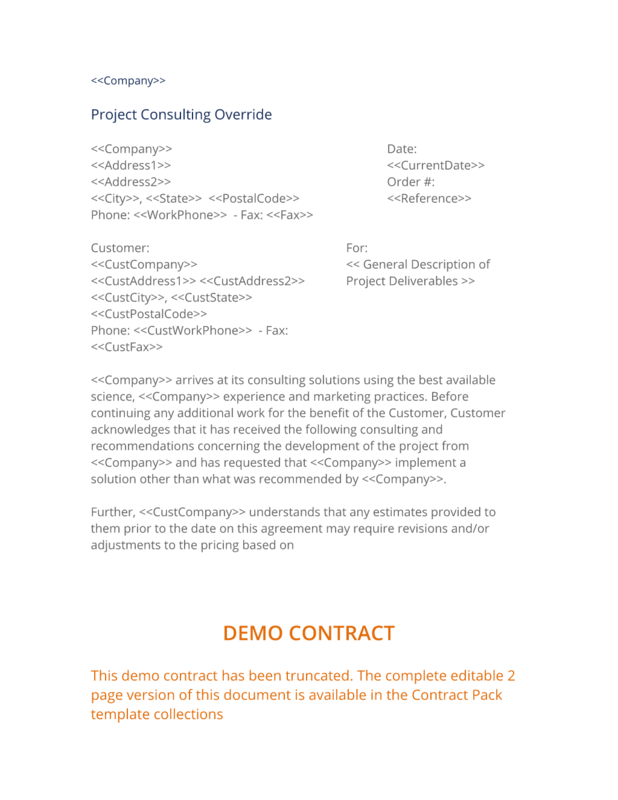 The complete Project Consulting Override - with the actual formatting and layout - is available in this Contract Pack.